These two buildings are among the most important sights of Istanbul. Whereas the Hagia Sophia dates back 1700 years, the Blue Mosque was built in the 17th century, at the height of the Ottoman Empire. Visiting these two important sights is a must for travellers to Istanbul. They cast light over the long and turbulent history of this city bridging Europe and Asia. Sultan Ahmed I decided to build a new mosque to honour Allah after he signed the treaty that secured peace with the Habsburg Empire in 1606. It was his favourite architect Koca Mimar Sinan Ağa that designed the building and it was completed in 1616. 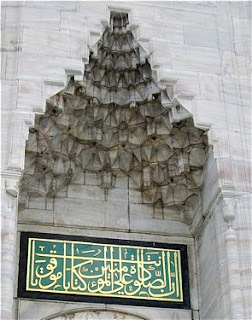 The official name of the Blue Mosque is Sultan Ahmed Mosque (Turkish: Sultanahmet Camii). Its nickname is derived from the blue tiles covering its interior. 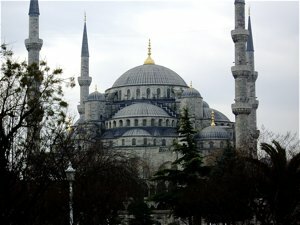 The Blue Mosque strongly resembles the Hagia Sophia. The Hagia used to be a Christian church and was converted into a mosque when the Ottomans conquered the city in 1453. 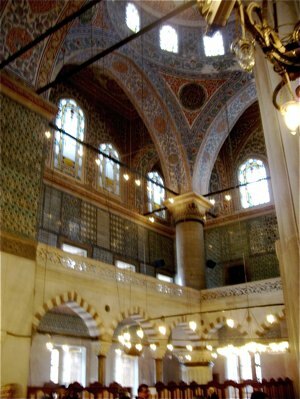 Koca Sinan incorporated the best from Byzantine and Muslim architecture into his design of the new mosque. A large central dome was placed in the centre of the construction surrounded by smaller domes, and large minarets placed in each corner. Whereas the exterior of this massive building are grey, the inside is covered with beautiful blue ornamental tiles with the most intricate patterns. This as depictions of plants, animals or humans are strictly forbidden in mosques but the enormous number of identical stylized patterns covering vast surfaces is breathtaking. 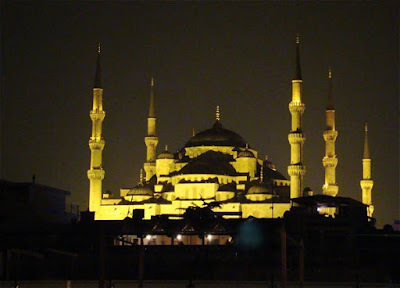 The visit to the Blue Mosque was my first visit to a mosque, ever. In Turkey, most major mosques are open, even for non-Muslims. If you go to visit, do observe important rules, and do remember that many are houses of worship. Remove your shoes on the outside, wear a suitable dress for the visit, and women must cover the head during the visit. Do observe the time of prayer, as all mosques are out of bounce for non-Muslims during these times.